Description: Who would have guessed that four minutes could change everything? Today should be one of the worst days of seventeen-year-old Hadley Sullivan's life. Having missed her flight, she's stuck at JFK airport and late to her father's second wedding, which is taking place in London and involves a soon-to-be stepmother Hadley's never even met. Then she meets the perfect boy in the airport's cramped waiting area. His name is Oliver, he's British, and he's sitting in her row. A long night on the plane passes in the blink of an eye, and Hadley and Oliver lose track of each other in the airport chaos upon arrival. Can fate intervene to bring them together once more? Quirks of timing play out in this romantic and cinematic novel about family connections, second chances, and first loves. Set over a twenty-four-hour-period, Hadley and Oliver's story will make you believe that true love finds you when you're least expecting it. 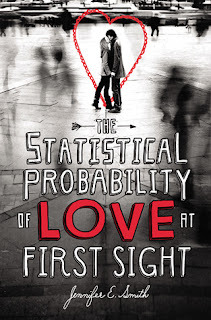 The Statistical Probability of Love at First Sight is charmingly sweet and utterly romantic. It’s a whirlwind of a story that makes you want to faithfully believe in love at first sight. Jennifer E. Smith presents a beautifully written narrative with pitch perfect characters, dollops of emotion, dizzying highs and lows, loss, love and family. Set over 24 hours, The Statistical Probability of Love at First Sight follows Hadley’s journey from New York to London where Hadley is attending her father’s wedding to a women she has never met. After missing her flight and stuck waiting for the next one, Hadley meets Oliver. Hadley and Oliver form an instant connection. Over the course of the next 24 hours, we get to see their story as they tempt fate and destiny. This book was a pleasant surprise, surpassing my expectations with its has a movie-esq feel that kept me flipping the pages to find out what happens next. It left me with a huge smile on my face. It was a pleasure to meet the acquaintance of Hadley and Oliver. The banter between them will make you laugh and smile. Hadley is the quintessential girl next door whilst Oliver is charismatic and witty. Each character had an emotional arc including the secondary characters. Hadley grew the most; gaining a new perspective on the important things. There were many great relationships represented in the book but Hadley’s relationship with her father was the most compelling. Jennifer E. Smith has an incredible ability to write characters that leap of the page. She writes characters you can relatable to. Characters you wish were your own friends. Even though Hadley and Oliver just met, they made such a lasting impressions that I was barracking for them to find each other. I am often hesitant to read books set over a short time frame. At times I feel that we don’t get to know the characters well enough and that often the events that happen in such a short time are not believable. However Jennifer has crafted a story grounded in emotion making these characters and their situation so believable and incredibly captivating. This book was packed with such heavy emotions that I was not expecting, a mix of happiness, love, sadness and anger. The statistical probability of love at first sight is an enchanting tale of fate and destiny that just might make you believe in love at first sight. A definite must read.